70272 Aurora Triumphans a.k.a. Dawn Medium Oil on canvas Dimensions 46 x 68 in. 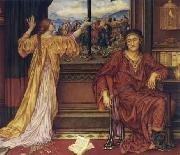 1855-1919 British Evelyn De Morgan Galleries She was born Evelyn Pickering. Her parents were of upper middle class. Her father was Percival Pickering QC, the Recorder of Pontefract. Her mother was Anna Maria Wilhelmina Spencer Stanhope, the sister of the artist John Roddam Spencer Stanhope and a descendant of Coke of Norfolk who was an Earl of Leicester. Evelyn was homeschooled and started drawing lessons when she was 15. On the morning of her seventeenth birthday, Evelyn recorded in her diary, "Art is eternal, but life is short..." "I will make up for it now, I have not a moment to lose." She went on to persuade her parents to let her go to art school. At first they discouraged it, but in 1873 she was enrolled at the Slade School of Art. 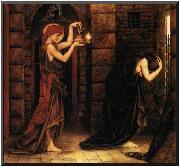 Her uncle, John Roddam Spencer Stanhope, was a great influence to her works. Evelyn often visited him in Florence where he lived. This also enabled her to study the great artists of the Renaissance; she was particularly fond of the works of Botticelli. This influenced her to move away from the classical subjects favoured by the Slade school and to make her own style. In 1887, she married the ceramicist William De Morgan. They lived together in London until he died in 1917. She died two years later on 2 May 1919 in London and was buried in Brookwood Cemetery, near Woking, Surrey.